Cologne - Matchday 6 may not have boasted the high-scoring encounters Bundesliga fans are used to, but it made up in kind with plenty of edge-of-your-seat action as FC Schalke 04 took the spoils in the 145th Revierderby, beating fierce rivals Borussia Dortmund 2-1 at the Veltins Arena in the pick of the fixtures. Elsewhere, FC Bayern München consolidated their position at the top of the table on the back of Xabi Alonso's record-breaking performance, Borussia Mönchengladbach climbed to second in an encounter which Stefan Kutschke played a starring role, while Lucas Piazon scored a contender for goal of the season. And with all this talk of the Champions League, that's our cue to bid you a fond farewell. Don't forget to check out bundesliga.com for all the breaking news from Germany's top flight as well as coverage of the FC Bayern, FC Schalke 04, Borussia Dortmund, Bayer 04 Leverkusen, VfL Wolfsburg and Borussia Mönchengladbach in Europe. As ever, we'll be back on Friday to bring you all the build-up to Matchday 7 in the League of the World Champions. Bis dann! You’d be forgiven for thinking this tweet from FC Bayern München was a bit misleading considering the lengthy injury list the German record titleholders are currently combating, but at least those that made the trip to Moscow are fighting fit for Tuesday’s UEFA Champions League encounter. put in on the weekend. victory, Schalke 04 legend Jiri Nemec paid his ex-club a visit at their training ground on Monday morning. The 84-time Czech Republic international (l.) also enjoyed a reunion with former team-mate Gerald Asamoah. The Bundesliga leaders arrived in Moscow yesterday where they are due to face PFC CSKA Moskva in the UEFA Champions League tomorrow, but Pep Guardiola and Co. were given a rude awakening in the Russian capital last night when their hotel had to be evacuated due to a fire alarm. Well, that's that for another weekend, but we'll be bringing you more reaction to Matchday 6 throughout Monday, so make sure you join us then. Don't forget to check out highlights from this weekend's matches on our WATCH page. Lucas Piazon's free-kick is definitely worth a look if you haven't seen it already (or worth another, if you have). Bye for now! A close encounter, but a deserved victory in the end. Three more points, we're delighted! ...ahead of Eintracht Frankfurt's trip to Hamburger SV this afternoon with a look at the Eagles' Top 10 Bundesliga goals. There are some corkers on there - it's well worth a gander! So, FC Schalke 04 record their first win over Borussia Dortmund since March 2013, FC Bayern München extend their lead at the top of the table and VfB Stuttgart earn their first victory of the season. It's been another eventful day in Germany's top flight, but tomorrow promises to be just as exciting with two more matches to look forward to. Remember to listen to Hamburger SV's clash with Eintracht Frankfurt on Bundesliga radio from 17:30 CET. We'll be back on Sunday with more reaction to this weekend's matches. Bye for now! What must these fans be feeling as they make their way to Schalke's Veltins Arena? Trepidation? Euphoria? Ecstasy? All of the above? Ciao for now! Saturday's Revierderby between FC Schalke 04 and Borussia Dortmund is inching ever closer. Don't forget you can follow the match live on Bundesliga radio from 15:30 CET tomorrow. If that doesn't tickle your fancy, check out your local broadcaster for the match at the Veltins Arena, and indeed all other Matchday 6 encounters, right here. You'll regret if if you don't. Thanks for the mentions, Rafa and Dante! LIVE NOW! 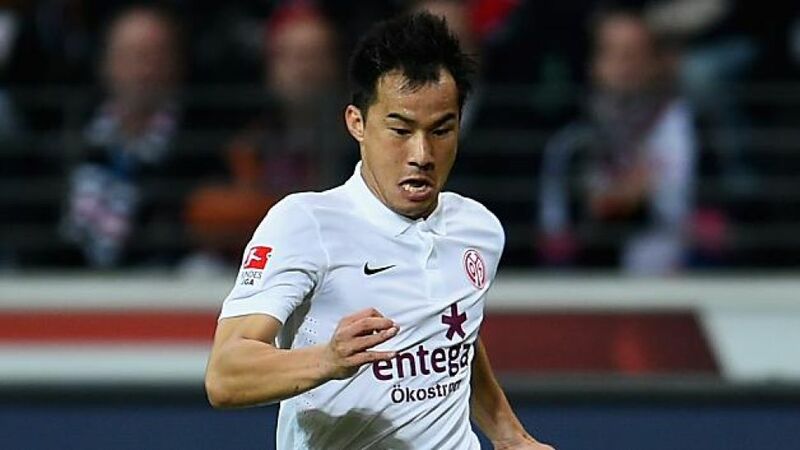 Three Bundesliga 2 matches are taking place tonight: Eintracht Braunschweig vs. SV Sandhausen, TSV 1860 Munich vs. Greuther Fürth and FC Erzgebirge Aue vs. VfR Aalen. You can follow all three live via our ticker. No rest for the wicked eh, Pep? result. In this case, there's no doubting that Rex is a Royal Blue fan! A fine Friday-before-the-Revierderby morning to you all! As you may have guessed, one game above all has got tongues wagging ahead of Matchday 6.
: the Revierderby, where loyalties are put to one side, as Germany World Cup winners Benedikt Höwedes and Mats Hummels illustrate. "United for Germany, separated by club colours, against violence", reads this tweet from Höwedes.